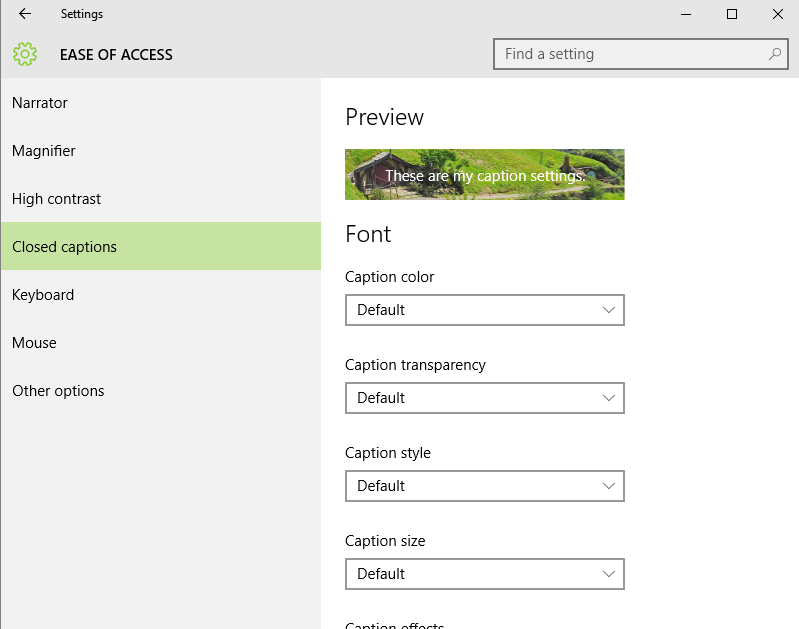 To open Narrator, go to Start menu, click on Settings, and now click on Ease of Access (Narrator, magnifier, high contrast). Click on narrator. Narrator is screen reader that reads on screen elements. Like text and buttons. 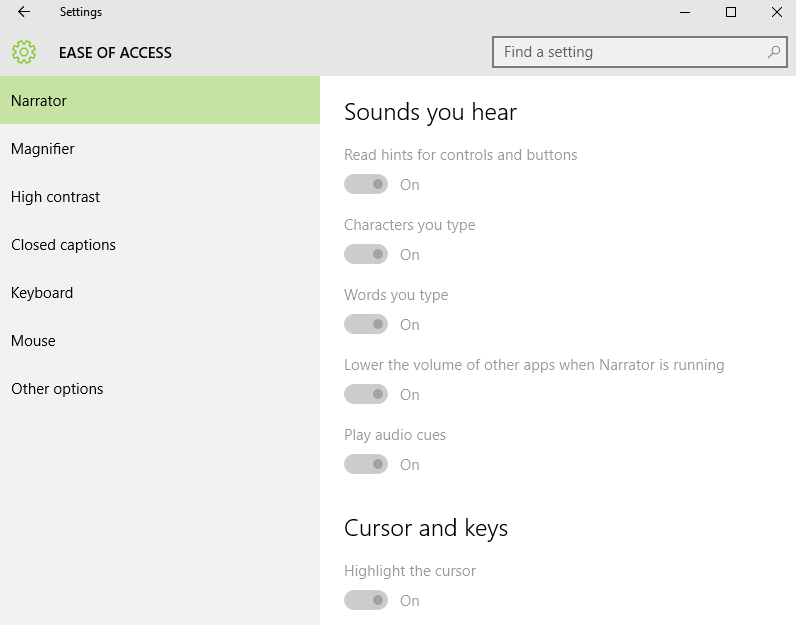 From here you can enable/disable narrator. 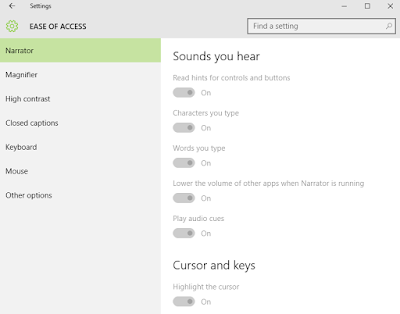 You can enable/disable narrator automatically. 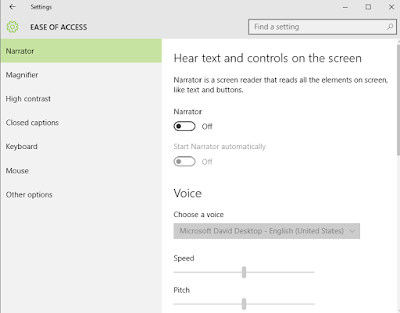 Further you can select voice for your narrator here. 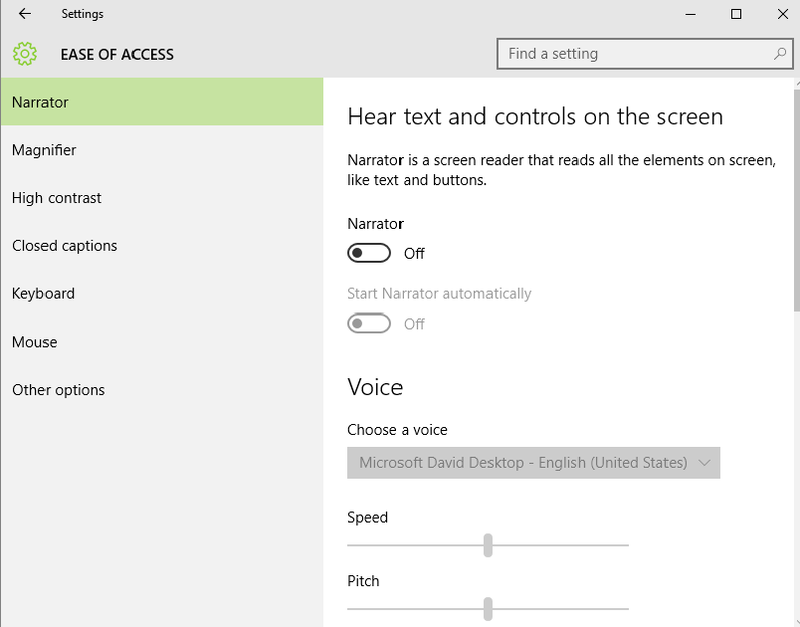 Next you can set Speed and Pitch of your Voice for your narrator. You can enable/disable Read hints for control and buttons, character you type, words you type, lower the volume of other app when narrator is running, play audio cues. Here you can enable/disable Highlight the cursor, have insertion point follow narrator and Activate keys on touch keyboard when I lift my finder off the keyboard. 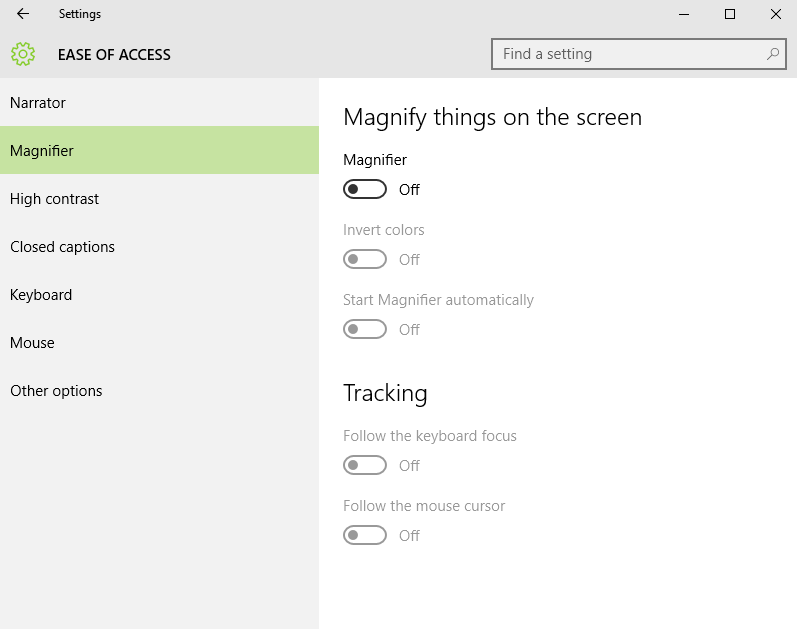 To open Magnifier, go to Start menu, click on Settings, and now click on Ease of Access (Narrator, magnifier, high contrast). Click on magnifier. Magnifier magnifies things on screen. 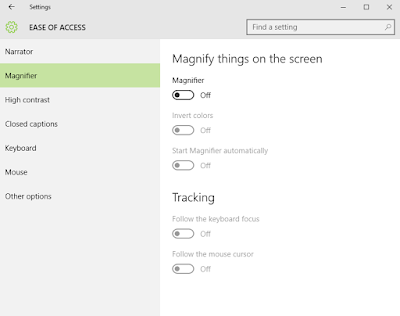 You can enable/disable Magnifier from here. You can also enable/disable Invert colors and Start Magnifier automatically. You can enable/disable Follow the keyboard focus and Follow the mouse cursor from here. 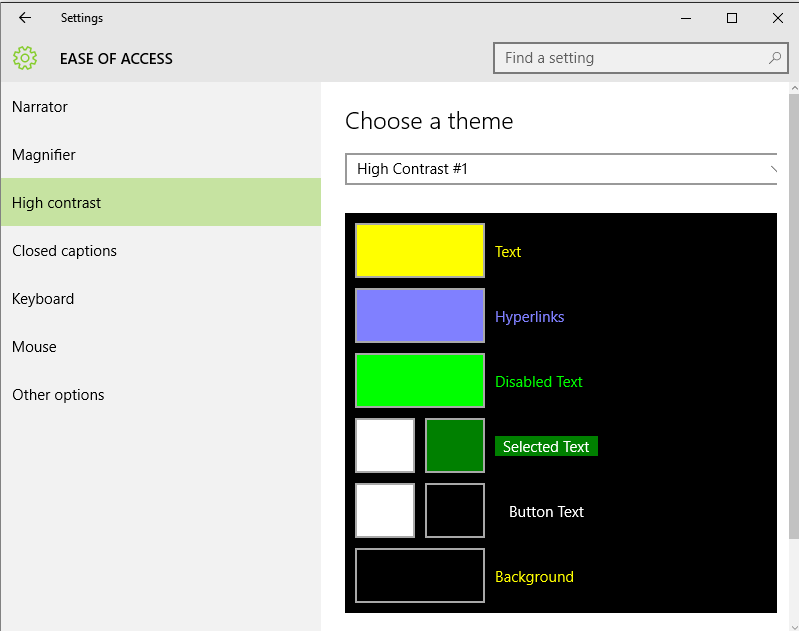 To open High contrast, go to Start menu, click on Settings, and now click on Ease of Access (Narrator, magnifier, high contrast). Click on High contrast. 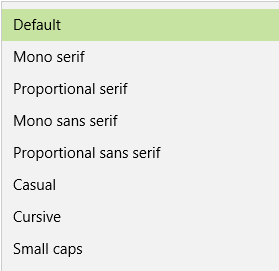 After selection press Apply button to change in current settings. 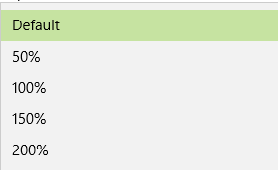 You can choose Cancel if you do not want any change. To open closed captions, go to Start menu, click on Settings, and now click on Ease of Access (Narrator, magnifier, high contrast). Click on Closed captions. You can see preview of your Closed caption here. In font you can change color of your caption. Here you can change background color of your Caption. You can select your caption’s Background transparency from here. 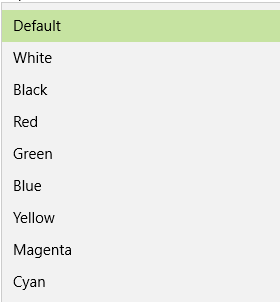 Change your windows color for your caption from here. 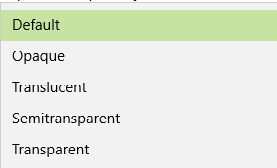 You can select windows transparency for your caption here. 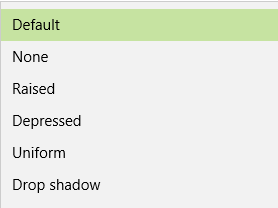 You do not the changes made by you, then click on Restore to default and all your changes will be undone.